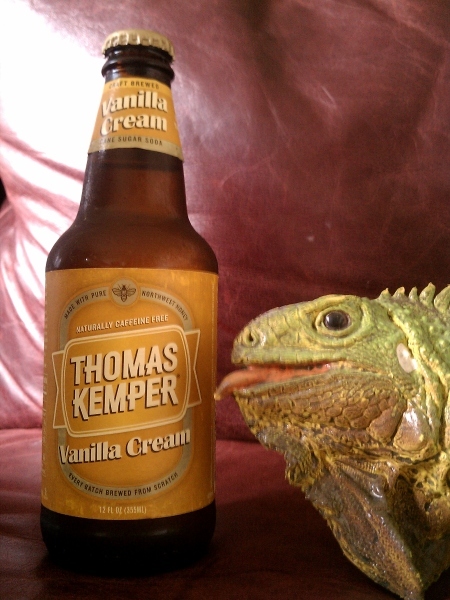 It seems that when you drink a Thomas Kemper product you’re probably not going to regret your choice. Hopefully today’s installment follows that particular path. In front of me sits a bee. The bee in front of me sits on a bottle of Thomas Kemper Vanilla Cream. As you probably know Thomas Kemper has both Northwest honey, and cane sugar included in the ingredients… so we may be in for a sweet treat here. Let’s take a whiff. It smells like a cream soda flavored Dum-Dum brand sucker… which is certainly not a bad thing, but I can assume (yes I know what happens when you assume) that this is going to be incredibly sweet from the aroma alone. I wasn’t really feeling a cream soda today, but this may get me to change my tune. Time for a drink. Well oddly enough it’s not a sweet as I thought it would be, nor is it all that creamy. While the bite you feel before the cream is weak, it’s still stronger than something you’d normally find in a drink as smooth as cream soda. The vanilla flavoring can’t be missed as it jumps in behind the initial fizz. Since I enjoy giving random analogies, and it seems a few of you enjoy them too, here’s one describing the relationship between the fizz and vanilla flavoring. Picture that you’re walking through an empty castle; you’ve been there a week exploring with your best friend, so you kind of know your way around. Turning through the corridors you hear the laughter of children coming from around the corner. Poking your head around you only see a deserted hallway, but no sooner do you turn back around that someone jumps out in front of you and gives your heart a slight rush. Don’t worry; it’s your best friend Fizz. Why his parents named him Fizz we’ll never know. It only takes a split-second to realize this and begin to calm down, but then a tiny deformed version of Fizz jumps out from behind him and screams at you. Thankfully tiny deformed Fizz is wearing a shirt that reads “Vanilla” so that this analogy would make more sense. That was just a fun way of saying, first you’re hit with fizz, then a dose of vanilla you can’t ignore… but the vanilla isn’t very smooth. This is an ok Vanilla Cream soda… but there better ones out there.